Besides creating a unique and custom styled sessions for you, DRP strives to do more than offer you timeless images. We are a hybrid photographer that creates custom products for your home and digital images to share with your family. With the digital age making it so convenient to let images sit on hard drives and float in clouds, sometimes our images don’t get printed. After your portrait session we schedule an ordering appointment where we sit down and view your images then create a plan on how to make physical copies of your art to enjoy for years to come with our heirloom products to pass down. Check out some of our most popular products below. Our album’s and book’s are one of a kind. Thick or thin seamless pages that do not bend make preserving your photos even more special. 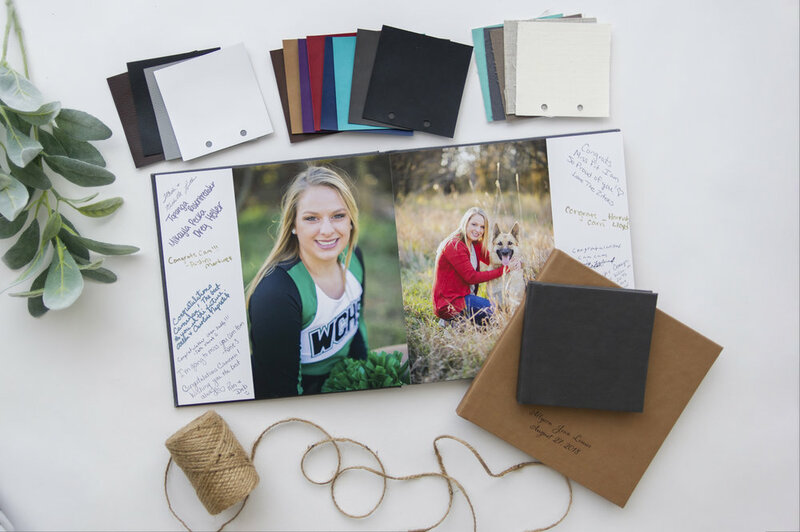 With over fifty materials options to choose from, it will allow you to customize your album to your style. Options to add etched leather patterns, embossing and even cameo (photo window) are also available. These are the perfect heirloom piece and are hands down my most recommended product to purchase from any session. These frames are the most timeless and classic product you can purchase. The frames are custom made by Farmhouse Frames in Michigan and are hand crafted by our dear friends Dave and Shannon. There are many sizes and styles available to fit your home. We have some awesome software that allows us to drag/drop your exact images into templates to show you a creation of what it will look like to give you an even better vision of your images in frames for your wall. Beautiful art pieces ready to be proudly hung on your walls. We offer a variety of sizes to fit your home, and would love to create a customized wall collage just as unique as your session! All canvases are 1 1/2” photo wrapped (on the sides). All of your prints are lustre-coated and mounted to preserve them. This makes sure that the print does not bend or warp like a normal print. This also makes them fantastic to display standing on their own or easy to pop into a frame. We offer a wide range of other keepsakes so you can cherish this special time in you life. These are also great for grandparent and holiday gifts. Announcements, Invites & Cards - We do the custom work for you so all you have to do is address and stamp! Birthday Boards - If your baby is turning a year older these are fantastic to display all the milestones they’ve celebrated. Mini Accordion Albums - Perfect little brag books that are fantastic to show off your recent images. Lockets & Keychains - Yellow gold, rose gold or silver, there’s plenty of options to customize these little lockets for your friends and family to see! These are perfect beautiful wood box for the family that likes having multiple prints and wants to purchase the digital package as well. Our handcrafted USB boxes are hand painted, distressed and sealed for preservation. Box showcases an 8x10 print lid and holds 5x7 mounted prints with an oak display that is included. A little preview of some of our favorite items from clients. contact to come view our samples in studio and look at the hundreds of options!